Although the premature arrival of Christmas decorations in stores would have you believe the holidays started back in late September, it's safe to say the festive season is officially upon us now that Halloween is just a speck of clown makeup stuck in your eyelid. In case you need further proof, Starbucks announced Tuesday its classic holiday drinks are returning to stores -- starting today, November 1st. That's right -- just when it finally felt like an appropriate time to sip a Pumpkin Spice Latte, decidedly wintry flavors like chestnut, eggnog, and peppermint are taking over the menu. Starbucks said its now serving the complete lineup of classic holiday espresso beverages (as well as their iced and Frappuccino equivalents! 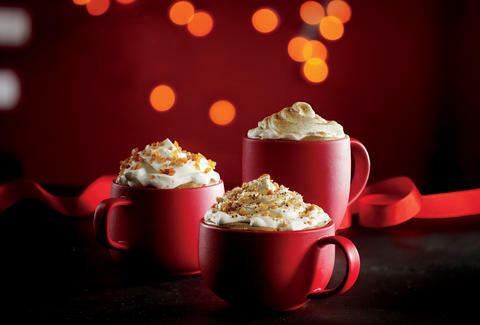 ): Chestnut Praline Latte, Caramel Brulée Latte, Eggnog Latte, Gingerbread Latte, and Peppermint Mocha, according to a press release. But there's just one glaring, red omission. Instead of launching the holiday drinks with its iconic and -- in the case of last year, controversial -- red cups, Starbucks said it will serve your next coffee in one of its all-new green cups. No, this has nothing to do with the so-called "war on Christmas." The cups, which feature a mosaic of more than a hundred people drawn in a single, continuous stroke, are meant to celebrate unity across the United States amid the nation's divisive political climate. 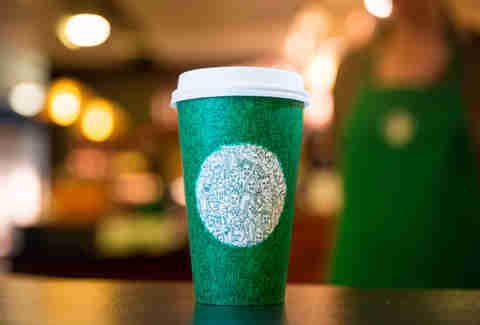 “The green cup and the design represent the connections Starbucks has as a community with its partners (employees) and customers," Starbucks CEO Howard Shultz said in a statement. "During a divisive time in our country, Starbucks wanted to create a symbol of unity as a reminder of our shared values, and the need to be good to each other." The coffee giant, however, made no mention of when its beloved red cups will arrive, but considering the green cup's obvious peg to the 2016 election, it's probably safe to expect them sometime after Election Day, November 8th. So, while you probably shouldn't post a photo of your ballot on social media, a Gingerbread Latte in one of the new green cups will almost certainly score you a few likes on Instagram. Tony Merevick is Cities News Editor at Thrillist and can't wait to have his first Gingerbread Latte of the season. Send news tips to news@thrillist.com and follow him on Twitter @tonymerevick.